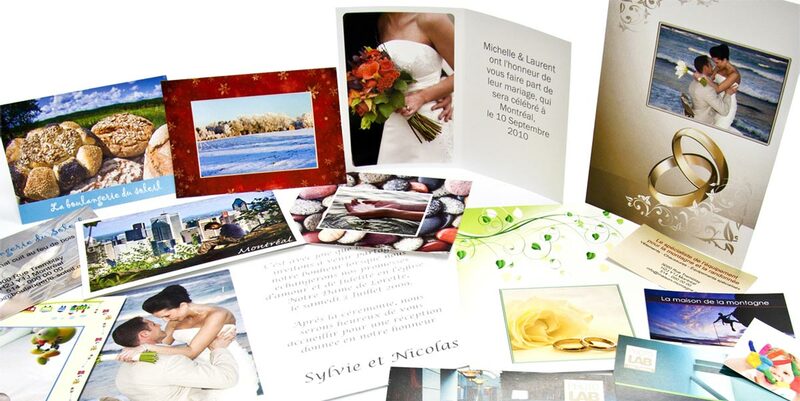 At Photolab Yves Thomas, we offer many different kinds of print services to meet your needs. From personalized photo calendars to sports cards, from business cards to postcards, we have a whole range of formats and sizes, as well as printing materials. Do you want to offer a personal postcard to family and friends? Use one of our downloadable software to create your postcards, send in your order and consider it done! Our photo postcards are printed on both sides of a flat cardboard surface. They are also ideal for promotion material, a thank you card or an invitation card for your employees. Postcards can be printed on one side or double-sided. Use ROES to create and send your postcard order. DO NOT add a border to your cards. The borders will be unequal. Please allow a bleed of 1/8 inch on each side of your images to ensure an edge-to-edge image after cutting. Avoid putting essential texts of image parts very near to the border of the card. Folded cards are ideal for situations when you want to include a message in a personalized photo card, such as greeting cards, invitations, promotions and thank-you messages. Our folded cards are printed on flat cardboard surfaces, usually double-sided. Use ROES to create and send your personalized folder photo card order. Please allow a bleed of 1/8 inch on each side of your card to ensure an edge-to-edge image even after cutting. Avoid putting essential texts or image parts very near to the border of the cards. Our photo lab can produce individual sports cards for each member of your sports team. Our sports cards are printed on two-sided cardboard and are produced in packages of 8 sports cards each. Use ROES to create and send your sports cards order. Please allow a bleed of 1/8 inch on each side of your sports card to ensure an edge-to-edge image even after cutting. Avoid putting essential texts or your team’s logo very near to the border of the sports cards. The majority of our products are printed on 300gms cardboard. Have any questions? Don’t hesitate to contact our photo lab and we’ll be happy to advise you on the best choices of materials, or on how to prepare your artwork for printing. If you’re looking for a different kind of business card, consider personalized photo business cards. Our cards can include high quality photos on one or two sides, and are printed on thick cardboard surfaces. Use ROES to create and send your photo business card order. Please allow a bleed of 1/8 inch on each side of your business card to ensure an edge-to-edge image even after cutting. Avoid putting essential texts or image parts very near to the border of the business card.